A climber who fell 100ft (30.5m) down a mountain and lived to tell the tale has spoken about his ordeal - which was also captured by his helmet-cam. Mark Roberts, a safety consultant and lifelong mountaineer, was climbing Snowdon with two friends when he was hit by a chunk of falling ice. The 47-year-old plummeted down Parsley Fern Left-hand Gully, sliding into a rocky outcrop which took some momentum out of his fall. Speaking to the British Mountaineering Council, he said: "There was no feeling of panic, more a concerted effort to protect my head and neck and be aware of what was below me." Mr Roberts was rescued by Llanberis Mountain Rescue Team. He was airlifted to hospital with ankle injuries but was not seriously hurt. Climbing is a risky pastime, one which takes many adventurers overseas to tackle the world's great peaks. 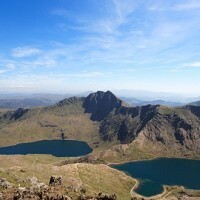 Although Mr Roberts' fall occurred in Wales, it acts as a reminder for those planning climbing trips abroad to arrange appropriate adventure travel insurance before leaving home. Mr Roberts added: "Interestingly, I had the foresight to check the cam was still attached and just hoped the vid had recorded that: it wasn't one for repeating!"